We’re trying to polish off the last of the winter leek crop to make way for new veg in the garden, so I’ve been making Vichysoisse soup, leek and potato frittata and bagging up sliced leeks with carrots and celery to make instant stock veg for the freezer, a useful time-saver if you’ve got the space. 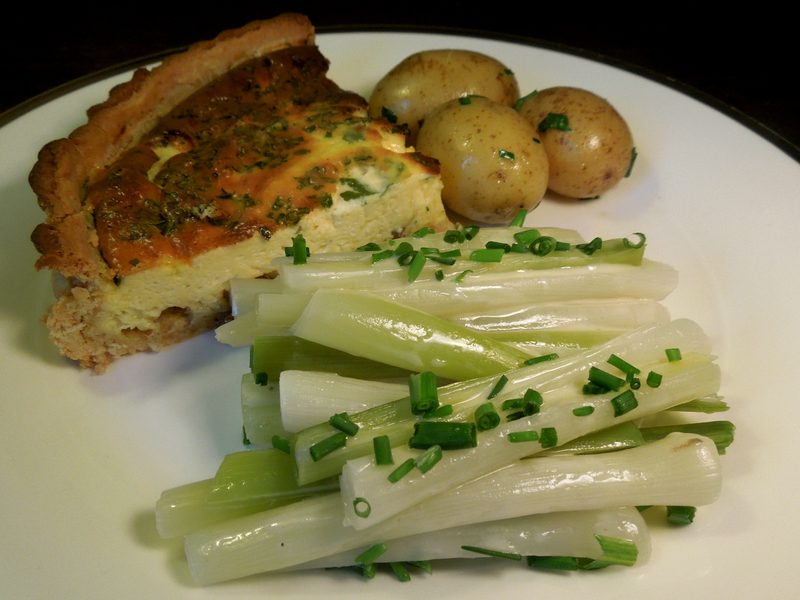 But the smaller leeks I set aside to make this, a summery little side dish. Simple but good. 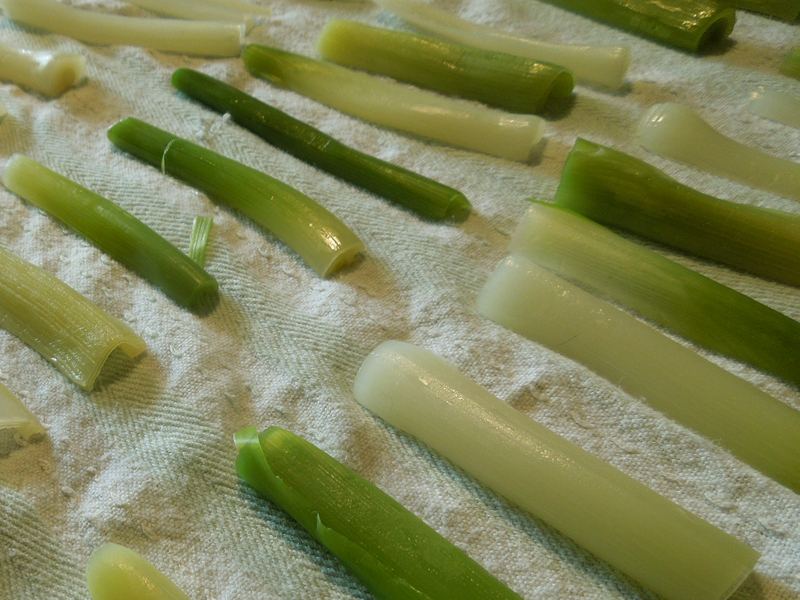 Trim the leeks, wash well, and cut them in half horizontally and then again vertically. Place them carefully into a steamer so they don’t fall apart and steam until tender to the tip of a knife. Remove them equally carefully and put them to drain on a clean tea towel. In a small bowl, whisk together the mustard, mayo, honey or nectar and the vinegar. Add the oil and whisk well until thickened then season to taste with salt and freshly ground black pepper. Taste and if it’s too acidic for you, whisk in a little more oil. 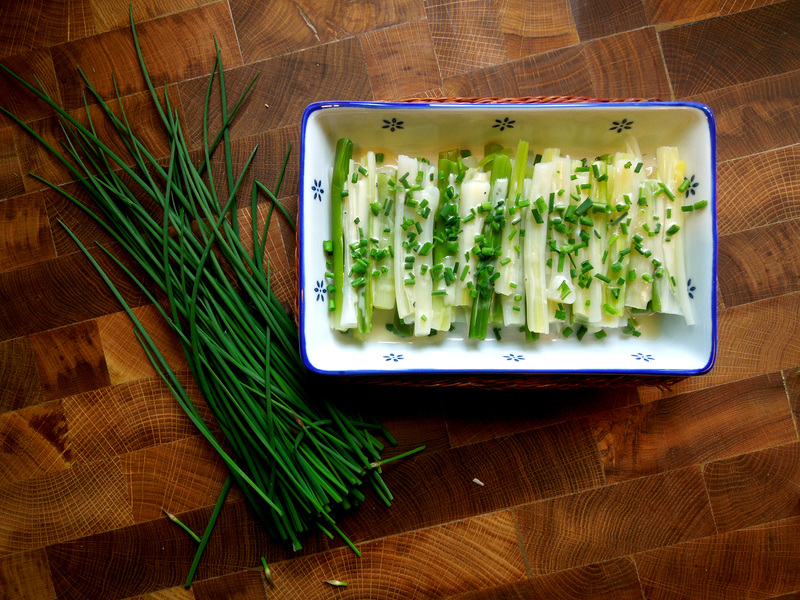 On a rectangular dish or plate, place a layer of leeks neatly side by side. Drizzle with the dressing. Repeat, layer by layer, until you’ve used all the leeks. Cover with clingfilm and chill. Remove from the fridge 15-20 minutes before you want to eat. This entry was posted in In the garden, Vegetables and salads, Vegetarian and tagged baby leek salad, leeks vinaigrette by Linda Duffin. Bookmark the permalink. Sounds lovely…. but I might just have to wait for summer, which has just done a runner. Hi Chip and thank you. If you’re using larger leeks I’d suggest using the tender white part, splitting them down the middle in the same way and cutting them into shorter sections. Test one when you’ve steamed them and if it’s not stringy they should be fine. Cheers, Linda. Very nice Linda. The baby leeks are so delicate compared to the huge things that make their way into our supermarkets. Thank you. Honestly, I love leeks any which way. I’m so pleased we’ve still got enough to play around with in different recipes – and to bung in the freezer.